Internet searches and guide books (mainly Lonely Planet SE Asia on a shoestring - every backpackers' bible) quickly told us this was a well-trodden route, with easy public transport options. So we decided upon our route; Chiang Rai to Chiang Khong, to Huay Xai, to Pakbeng and finally Luang Prabang. 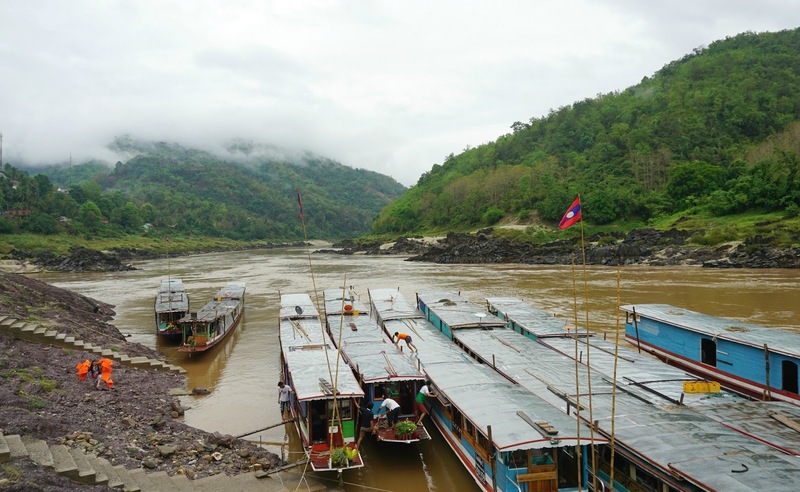 The slow boat from Huay Xai to Luang Prabang takes two days and is pretty basic; not particularly comfortable seats and limited leg room, but beautiful views down the Mekong and if your lucky some good company. We were lucky enough to meet a couple on our boat who we chatted with over the two days, and then met up with again and again in Laos and later Vietnam. We went for the standard boat option, but we did see others who had booked through an agent and had a more spacious set up. Perhaps worth the money if you can spare it! As with most places in Thailand, there are always travel companies who can organise transport to popular destinations for a fee. We decided to make our way to the border ourselves after getting the info from our hostel - it was pretty easy, and cheaper than going via an agent. 1. Get the 6am bus from the Chiang Rai bus station going to Chiang Khong - it costs 65 baht (£1.30 in May 2016) per person and takes around two hours. 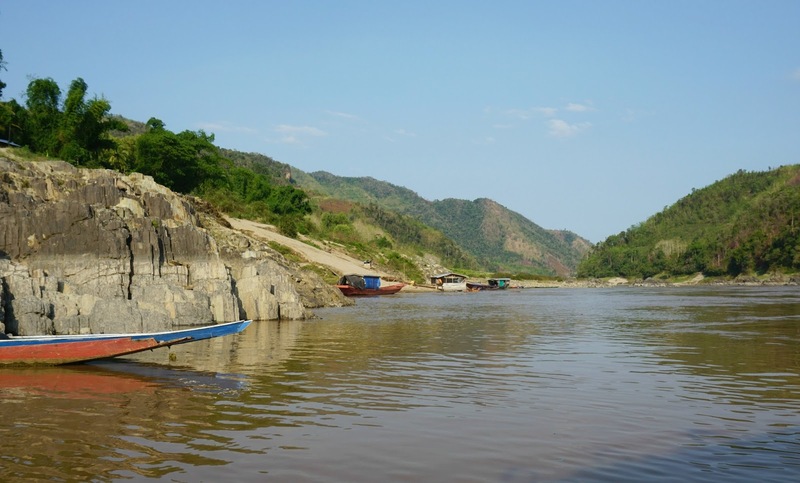 If you get the later bus (7am), you risk missing the slow boat leaving Huay Xai. You'll see amazing scenery and locals hopping on and off on their way to work... or in my case fall asleep and wake up with your head on an old Thai man's shoulder. Awkward. 2. The bus will drop you at an intersection (ask the driver to tell you when you're there!) where you will need to get a tuk tuk to the border - there were tuk tuks waiting for us there, I assume it's pretty guaranteed business. The tuk tuk cost 50 baht (£1) each. 3. At the border you will need to get your visa stamp out of Thailand, and a bus will take you across the friendship bridge to Laos! The visa for Laos cost us (UK citizens in 2016) $35 each, there are currency exchanges at the border. 4. After getting your visa, you'll need to get a bus/jeepney to Huay Xai - there will be loads waiting outside the border office. Be sure to haggle!! We paid 50,000 kip - just under £5. 5. When you arrive in Huay Xai (we got there at around 10am, with plenty of time to spare - phew!) 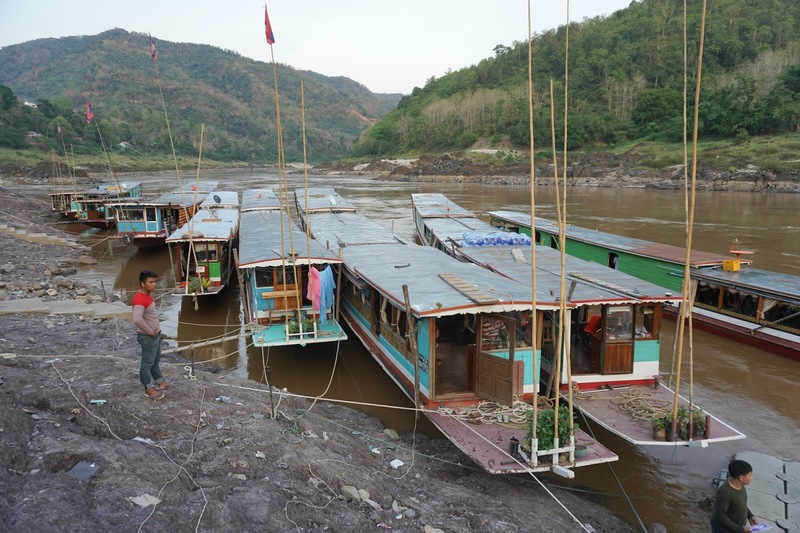 go to the office and buy your slow boat ticket - we paid 210,000 kip each (around £20). Pop down the road to the road-side cafes and buy yourself some supplies for the long day ahead - baguettes and cans of beer were essential! You can buy drinks and snacks on board, but there is a limited supply and they are overpriced. 6. Board your boat, and settle in! We arrived in Pakbeng at 6pm and stayed at DP Guesthouse - accommodation is pretty average and can get booked up in peak season, so consider booking ahead. 7. Next morning, again buy snacks and drinks and enjoy the final stint to Luang Prabang. You'll be dropped off just outside of LP itself - this is not a scam! We heard hilarious stories of sit-in protests on the slow boats once arriving at the drop off point and passengers refusing to leave as they weren't in central LP. The taxi cost is minimal and takes about 15 minutes. You've come this far! 8. We stayed at Villa Maydou in Luang Prabang and I couldn't recommend it enough; gorgeous rooms, good breakfast and a beautiful setting.